As of the latest Windows 10 Preview build released a few hours ago, Project Spartan app is finally renamed to Edge and brings a plethora of improvements. 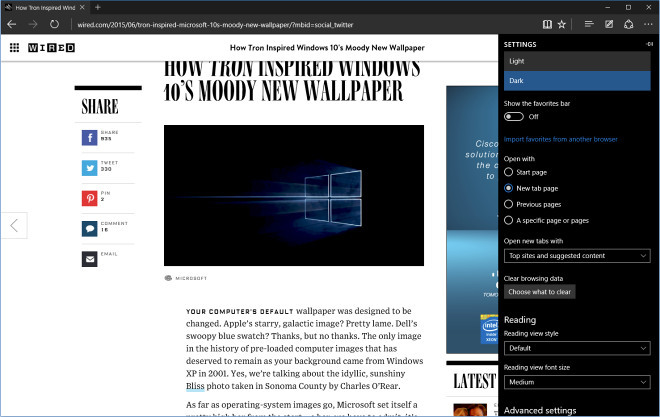 The updated Edge browser now brings back the Home key, supports import/export bookmarks, password autofill, drag and drop tab support, a new dark theme available, among other stuff. The new build of Windows 10 also improves on Cortana, Office, Photos app, Snipping Tool, and general system-wide UX enhancements. Windows 10 release date is July 29, so it makes sense for the Edge browser to be entering final development stage. Hopefully everything will be ready in time for the global release.